A lot of folks are still unaware of this fairly new relationship between Botox and dentistry. What does a dentist know about facial aesthetics? As it turns out, a lot. Dentists are experts in the entire myofascial region, including your teeth, gums, jaws, face, head, and neck. Plus, we’re already highly skilled at giving precision and painless injections in these delicate facial areas, and with the help of dental blocks (local anesthetic), we can provide a more comfortable and pain-free experience from the comfort of your dental home. But wait… there’s more! Aside from treating fine lines and wrinkles, Botox serves another amazing purpose as well. Botox can actually be used to treat chronic pain associated with TMJ dysfunction and may even be able to prevent migraines before they start. 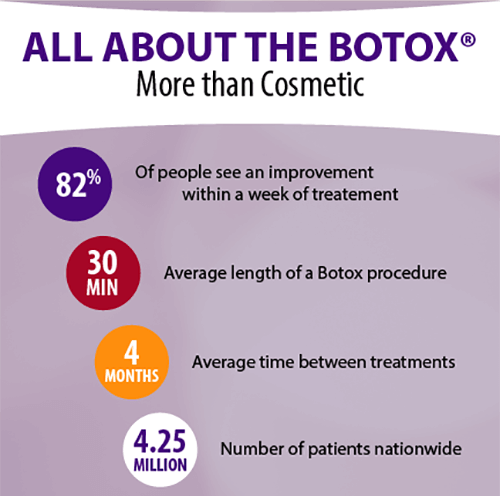 Treat your pain & take years off your appearance with Botox. Botox has historically been famous for cosmetic and aesthetic purposes in treating fine lines and wrinkles, and in the field of dentistry, is often used in areas around the mouth. However, there are therapeutic reasons for Botox as well, including pain management and treatment of TMJ dysfunction, or TMD. By inhibiting the micro muscle contractions that contribute to this pain and tension, Botox can be used effectively for treating and even preventing chronic headaches and migraines, and tooth pain that’s caused by the head and neck muscles. What a relief! If you’re seeking Botox for pain relief, you can also enjoy the added cosmetic benefits of fuller, smoother skin and diminished fine lines and wrinkles. Talk about two birds with one stone! If you don’t need any pain relief, but would love to turn back the clock on your facial appearance, we can help you there, too. When used at a younger age, Botox can actually help relax the muscles so they are used less frequently, therefore becoming less pronounced over the years than they would be without Botox. Botox allows your body’s natural collagen to remain healthy and intact, so you can keep your natural radiance around for years to come. We’re also happy to provide dermal fillers to plump up lips and supplement facial lines, folds, and creases for a more supple, youthful glow—all from the comfort, convenience, and discretion of your dental home. There’s no need to seek out a facial aesthetics specialist or cosmetic surgeon, we would be happy to provide all your Botox and dermal filler needs right here at Veranda Dentistry. If you have any questions about Botox or dermal fillers, or you’re ready to schedule a visit with your Pleasant Hill Botox dentist, Dr. Johnson or Dr. Flesner at Veranda Dentistry, give us a call today or get in touch with us online.